Tremont 647 has always been one of our favorite restaurants in the South End, and we have frequently mourned their general lack of nachos. 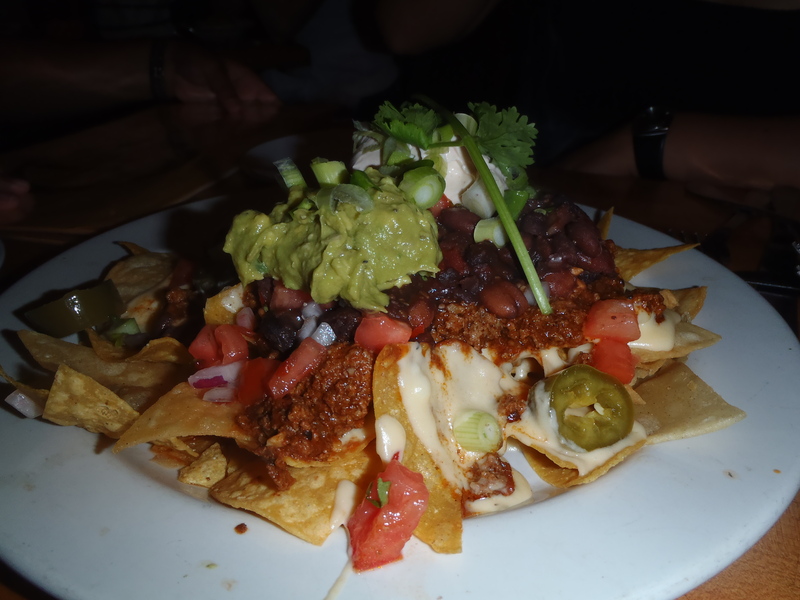 It’s not surprising that the neighborhood is a little barren of our favorite food, but then again, the upscale joints in the area are not the type where one would expect to find nachos. But we had always nursed a little hope because Tremont 647, with it’s hip-but-not-too-hip atmosphere, somewhat focus on Mexican flavors, and general lack of pretentiousness, seemed like just the type of place that might surprise us. And it did! On a recent $2 Taco Tuesday, we were thrilled to find these on the menu: “Ymar’s Famous Turkey Nachos” with three cheeses, beans, pickled jalapenos and guacamole. Quality of Ingredients: (9) Within a few bites we could tell that every single ingredient on these was homemade, which is a rare experience. The chips were thin, crisp and salty, and the guacamole delicious. The turkey chili spoke assertively of its main ingredient, which gave it a distinctiveness in an arena where such is rare. The cheese sauce was the only questionable ingredient: while it added a welcome lightness to these nachos, it was not extremely cheesy and had a bit of a gritty texture. Because there was no mention of it in the description, we assumed that the white dollop on top was sour cream, so imagine our delight when it turned out to be a spicy yet refreshing chipotle-lime cream! This was one of the highlights of these nachos, evidencing that this restaurant goes out of its way not to cut corners. Distribution of Toppings: (8.5) We soon resorted to forks because the chips, especially in the center and bottom of the dish, were so drenched in toppings. The cheese sauce, per its nature, aided in the distribution. Despite this barrage of succulence, the chips stayed moderately crisp to the last. Price: (8) Not bad at $10, which is even better when offset by the delicious $2 tacos we had for the main course. Overall: 34.5. Not only your best bet for nachos in the South End, one of the best nachos in Boston. Take heed though, these are only available on the special Tuesday menu. So next week, fight through the crowd, elbow out some space at the bar, order yourself up a specialty margarita (we recommend the strawberry-rhubarb!) and get friendly with these nachos. Ymaris Matias, the “Chief Executive Officer of Tacos” according to menu, has got a definite handle on the nacho division as well. ← CitySide’s Buffalo Chicken Nachos: The Horror, The Horror!